Sandra Aird, Glasgow Schools Outreach Officer, talks about the education project the RSPB is working on in partnership with ALDI. “We live in a big little planet. We are the ones who have to look after it”. Glasgow Primary Pupil, 7 years old. What is it like to connect with nature: the senses, emotions, intellect, well being and curiosity enlivened (or calmed)? Imagine the damaging impact disconnection with nature has on children, families and nature. That’s why we have an exciting and ambitious new Schools Outreach Programme to challenge this and reverse the disconnection trend. In partnership with ALDI we are working together to give nature a home. This is currently being offered in 15 cities throughout the UK. It's a three year funded programme and has already been achieving great things in the cities where it has been launched. It is delivered in partnership with schools and I have the privilege of launching this as the Glasgow Schools Outreach Officer. Watch our video shoot here and find out more about the three FREE sessions available to primary schools in the project areas. A big thank you to the Glasgow Gaelic School for taking part in this promotional video. RSPB Scotland – Which Cities? The programme has launched in Glasgow and Edinburgh and will be launching in Aberdeen soon. But what about the reserves, the beaches, the countryside... why cities? 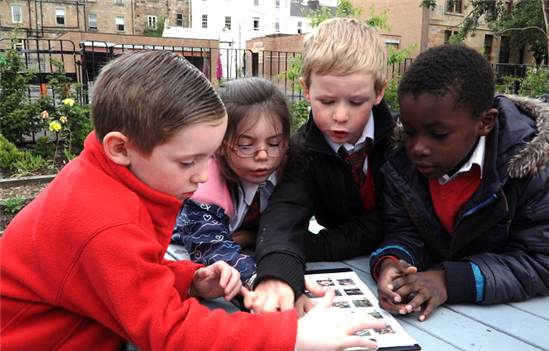 These are our hubs of activity and high density populations, where we are targeting sessions in primary school grounds and green spaces to help as many children make connections with nature as possible. Valuable and meaningful connections, that will hopefully be part of influencing future positive actions. Children (all children) need nature connections. Nature needs to connect with children. As Schools Outreach Officers we will work with children, teachers and schools in their own green spaces to help them on this journey. Like to join us on the outreach journey or support the project? Volunteering is a great way to start. We will be looking for volunteers to train and deliver this project in schools in Glasgow. My colleagues in Aberdeen and Edinburgh are also looking for volunteers. Together we can create a legacy of connecting children to nature and that will impact positively on our “big little planet”. Look out for updates from me and my colleague Laura Copley, Edinburgh Schools Outreach Officer and the schools who celebrate their inspirational activities which Give Nature a Home. Look out for and get involved in Wildlife Action Awards achievements too.